Unapologetically Female: Amen, GraphJam. Amen. Anthony just said there are pheromones in Axe that make you attracted to men. I so hope that's true. 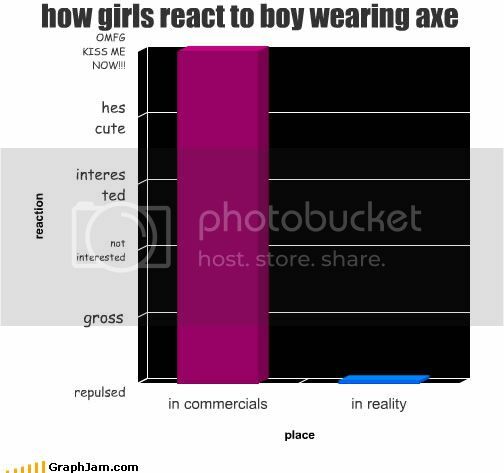 I gag each time I smell someone wearing Axe. The smell is horrible! I prefer if all men just wore Old Spice or nothing. Well, even if there are pheromones in it, it sure didn't make me attracted to all of my middle school students who drenched themselves in it. Maybe it just doesn't mix well with pubescent male sweat in a stuffy band room. Every time I smell it now, I feel completely ill. I wholly agree. I got a free sample of the stuff and used it once. It stinks so bad I could taste it. Disgusting! I can't see how women would be turned on by it. That's marketing for you.